With the outdoor activities you're partaking in and the recent talk of Zika and the ever-present West Nile Virus, you might be starting to think of ways to keep mosquitoes, flies, and other insects off of yourself and your dogs. Dogs aren't (currently) known to get Zika, but they certainly can get West Nile and they (sadly) often get Heartworms… all from mosquitoes! While there are plenty of products out there to help keep insects off of you, when it comes to your dogs, there are only a handful that are both safe and effective. And many of the mosquito and bug repellent products for people are just downright unsafe for your pets! Three products that have a proven track record of being both effective at keeping insects away and being safe on dogs* are listed below. Talk with your veterinarian to ensure that the product is safe for your dog, given age, size, and other factors, and be sure to use all products strictly according to the label. Note that these are all insect repellents – they are not "heartworm preventatives" in the true sense of killing and preventing heartworms. 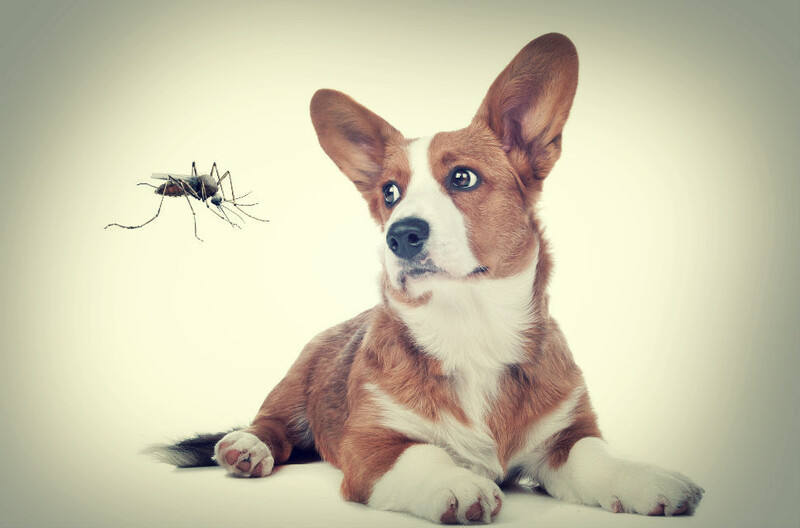 They do help by keeping mosquitoes away, but since no repellent is 100% effective and it takes just one bite from one infected mosquito to cause a heartworm infection, you should still use a heartworm preventative in conjunction with one of these repellents. *Note that these products are NOT safe for use on cats! In fact, they’re not even necessarily safe to use around cats, as cats are great groomers and many will even groom (or rub up against) your family dog. See more below. Is It Safe To Use Human Insect Repellents On Dogs? Some essential oils — including tea tree, neem, lemon eucalyptus, and citronella — can be useful in keeping mosquitoes and other insects away from your dogs, but it’s important to only use DILUTE formulations of these oils. The concentrated oils can cause very serious problems for dogs if applied to their skin or if they ingest them (including licking them off their fur). and even the diluted ones can cause problems for cats (so it’s not recommended to use these on dogs that spend a lot of time around cats). Stay away from DEET! Most of the common bug sprays and mosquito repellents for people contain DEET, in varying concentrations. DEET can be very toxic for dogs, leading to vomiting, staggering, seizures, and other concerning problems. Do not use DEET-containing insect repellents on your dogs and make sure they don't lick you when you have it on! Picaridin is another common active ingredient in insect repellents made for people. Though it appears to have a wide margin of safety when used on dogs, there are no products specifically licensed for use on dogs that I am currently aware of. Cats are exquisitely sensitive (in the toxicity sense of the word) to DEET, which is one of the most common chemicals used in topical fly, mosquito, and other insect repellent products for people. DEET should be considered an absolute no-no for use on or around cats! When it comes to picaridin, it’s difficult to say for certain whether it is safe for use on or around cats. Although picaridin has been demonstrated to be safe in other species, including dogs, there’s no published evidence about toxicity in cats. Long story short, we don’t know for certain whether picaridin is safe for cats. What I can say, is I’m not aware of any picaridin-containing products that are specifically licensed for use on cats. What about the insect repellents for dogs (or horses and farm animals)? Yeah, there again unfortunately… danger. The most common class of active ingredients in these products are of the pyrethroid (pyrethrin/permethrin) class of compounds, and while concentrations of pyrethroids below about 1% are typically safe for topical application on cats, it’s not always the case and many of these products have pyrethroid concentrations well above the 1% level. Because of this you should never use a “dog-only” pyrethrin/permethrin-containing product on your cats (as many people sadly do) — pyrethroid toxicity in cats is distressing to see and is often devastating, and can be fatal. What about essential oils, you might ask? Some essential oils can have insect repellent properties (e.g. neem, tea tree, mint, lemon eucalyptus, and even catnip) — but essential oils need to be used in a very dilute form, if at all, around or on cats, as they are (again) very sensitive to them. Besides, while using catnip oil on your dog may keep the mosquitos and other insects at bay, I'd imagine your dog would prefer to take their chances with those pests, rather than the attack your cat is likely to mount on them! And using dilute catnip oil on your cat to repel insects… while it might make for a funny YouTube video, it'd be plain cruel to tease them that way! As you can see, you need to be thoughtful and careful when choosing mosquito/insect repellents to use on a dog that spends time around cats. And, unfortunately, there really just aren’t any great options for topical application directly to cats. All of this makes environmental mosquito (and other insect) control that much more important… for your cats, your dogs, and for the rest of your family too. Stay safe and enjoy the outdoors!